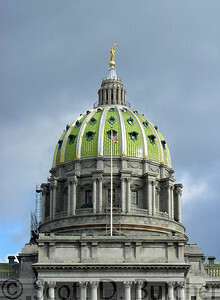 I was recently in Harrisburg for a meeting held not far from the Pennsylvania State Capitol building. As I walked to my car, I was buffeted by the winter winds coming across the Susquehanna River. And while the day had been bright when I went into my meeting, dark clouds had since moved in, dropping an occasional random snow flurry. In other words, it was not a pretty day. Still, as I headed back to the office, I decided to drive by the Capitol, because it is quite magnificent in its architectural styling. When I passed by, a small hole opened in the gray canopy above, and the gilded statue atop the dome began to sparkle. I didn’t have my camera gear with me, but I did have a Coolpix point-and-shoot in my briefcase, so I parked on State Street, jumped out, and ran to the center of the road to take a quick shot before the unique scene abated. The green dome is stunning on any day, but more so when framed by a deep cobalt sky. This day offered a different type of lighting – one that can be quite dramatic. The dome glistens like emeralds, surrounded by a foreboding sky. Sometimes ugly days offer up great photographic possibilities. And as for equipment, well, sometimes a point-and-shoot is all you really need.